Tonight’s dinner (Cook's Illustrated Cookbook, page 143) was a repeat. And there is a reason for that. It is good. Simple, flavorful, colorful, good. It was just me and the little twins tonight, so I halved the recipe, using only 6 ounces of steak and assorted (unmeasured) vegetables. Once again, since you don’t have the benefit of an online recipe, I’ll give you the gist without giving it all away. I’m telling you. This book is really worth the purchase. Have a Santa list started yet? Put this book on it. It is important to prep everything before you start cooking. 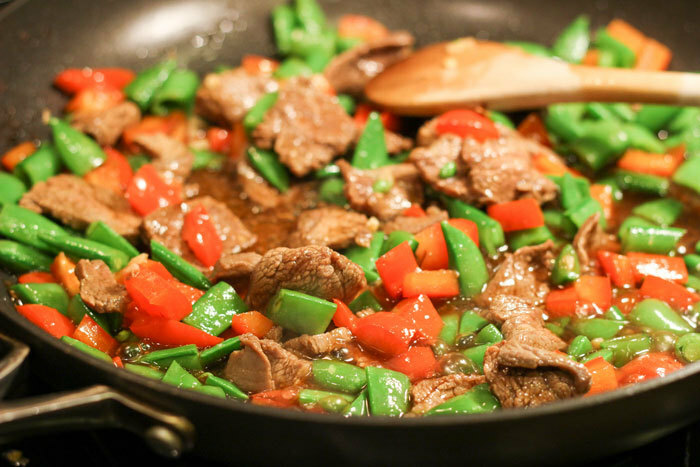 Throw your flank steak in the freezer while you make the sauce (oyster sauce, chicken stock, cooking sherry, and a few other items) and chop your vegetables (red peppers and snow peas). Cutting the slightly frozen flank steak is much easier than trying to saw through it just out of the fridge. It also helps to have a good knife. People seriously underestimate how important that is. Let your flank steak sit in a nice mix of soy sauce and sugar for 10 minutes or so while you finish chopping your vegetables or cleaning up play-do or whatever it is that is going on in your house during meal time. It’s always something. Once everything is ready to go, cook your beef in hot oil. Remove. Clean the pan. Cook your vegetables in hot oil. Add a nice garlic/ginger/oil mixture to the center of the pan until it smells heavenly then stir in with your veggies. Add the beef back into the veggie mixture. Add the sauce. Serve over rice. How easy is that? And how great is it when your kids ask for edamame as a snack before dinner? Yes, you can have seconds of soy beans!